1) E-Journal section has been added in IRGREENRI website with Presentations on “Achievement & Plans of Indian Railways” and “Mission 41k through Integrated Rail Energy Management System”. 2)"RAILSAVER" Mobile Application has been inaugurated on 3rd November 2016. 3) Railway is Naturally a Green mode of Transport. We want to make it further Greener by adopting Renewable Energy as a major source of Energy for Railways. 4) Travel with Greener Mode of Transportation - Indian Railways. Day 2017, on June 5th 2017 at National Rail Museum, New Delhi. on 3rd November 2016 at New Delhi. Shri Suresh Prabhakar Prabhu, Hon’ble Minister of Railways addressing in International Conference on Decarbonization of Indian Railways - Mission Electrification, on 3rd November 2016 at New Delhi. Shri A. K. Kapoor, Member Traction, addressing in International Conference on Decarbonization of Indian Railways - Mission Electrification, on 3rd November 2016 at New Delhi. Shri V. K. Agarwal, Addl. Member (Elect. ), presenting technical papers in International Conference on Decarbonization of Indian Railways - Mission Electrification, on 3rd November 2016 at New Delhi. Inauguration of “RAILSAVER” Mobile Application by Shri Suresh Prabhakar Prabhu, Hon’ble Minister of Railways in presence of CRB, Member Traction & Jaco Cilliers, Country Director, UNDP. Inauguration of “RAILSAVER” Mobile Application by Shri Suresh Prabhakar Prabhu, Hon’ble Minister of Railways in International Conference on Decarbonization of Indian Railways - Mission Electrification. Award of LOI to Ministry of Power for carrying out electrification work in Indian Railways during International Conference on Decarbonization of Indian Railways - Mission Electrification on 3rd Nov 2016 at New Delhi. Award of LOI to IRCON for carrying out electrification work in Indian Railways during International Conference on Decarbonization of Indian Railways - Mission Electrification on 3rd Nov 2016 at New Delhi. Award of LOI to RITES for carrying out electrification work in Indian Railways during International Conference on Decarbonization of Indian Railways - Mission Electrification on 3rd Nov 2016 at New Delhi. Senior Railway Officials during inauguration of International Conference on Decarbonization of Indian Railways - Mission Electrification on 3rd Nov 2016 at New Delhi. Signing Ceremony of MoU between Ministry of Railways, Ministry of Power & Ministries of Renewable Energy for co-operation in Power for Railways & harnessing of Renewable Energy on 12th Aug. 2015. MoU between Ministry of Railways, REMCL and EESL (Ministry of Power) for Implementation of Energy Efficiency Projects in Indian Railways. Inauguration of 30kW Solar Plant at Rail Bhawan by Shri Suresh Prabhakar Prabhu, Hon’ble Minister of Railways and Shri Manoj Sinha, Hon'ble Minister of State for Railways. LED color facade lighting of Chhatrapati Shivaji Terminus Mumbai. » Conference on E-Mobility in Indian Railways on 4th September' 2018 at Pravasi Bhartiya Kendra, Chanakyapuri, New Delhi, India. » International Conference on Green Initiatives & Railway Electrification, 27th & 28th October 2017, New Delhi, India. » Ministry of Railways celebrates World Environment Day – 5th June 2017 unveiling of Environment Sustainability Report by Hon’ble Minister of Railways Shri Suresh Prabhakar Prabhu, technical talks on Low Carbon Mass Transportation System at National Rail Museum, New Delhi. » International Conference on Decarbonization of Indian Railways-Mission Electrification on 3rd Nov 2016, at Hotel Le-Meridien, New Delhi, India. » International Seminar On Wind Energy – Opportunities in Rail Sector, on Friday, 20th November 2015, at Y. B. Chavan Auditorium, Mumbai, India. 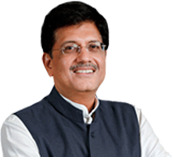 » International Summit on Energy Efficient Technologies in Railways on 6th Nov2015, at Taj Palace, New Delhi. » MoU between Ministry of Railways, Ministry of Power & Ministries of Renewable Energy. » MoU between Ministry of Railways, REMCL and EESL (Ministry of Power) for Implementation of Energy Efficiency Projects in Indian Railways. »INDIA @ COP 21, 4th December, 2015/ India Pavillion, Le Bourget, Paris. "Railway is Naturally a Green mode of Transport. We want to make it further Greener by adopting Renewable Energy as a major source of Energy for Railways". Hon’ble Minister of Railways, said while addressing a conference on Solar Energy opportunities in the Rail Sector.